Why choose Lifver coaster and holder set? Simple modern style: grey line design, simple but fashionable, great for office, cafe, study room, bedroom and other occassions. Water-absorbing: Lifver porcelain coasters are super water-absorbent, protecting your furniture from stains or water rings. Cork back: the cork at back can avoid scratching your furniture and prevent coasters from falling off the table. Cleaning Instruction: PLEASE BE AWARE, these coasters stain more easily than other Lifver dark colored coasters due to the white base color. They are excellent in absorbing fluid drips from cold drinks but vulnerable to coffee & tea spill. We recommend you to buy LIFVER Mandala coaster ( limited-time 30%off coupon available NOW) if you need coasters for coffee or tea. To remove stains on the coaster, soak it in 1 part household bleach and 3 parts water until stain lifts then rinse and air dry. Matt metal material: stain resistant and scratch proof, not to get rusty or deformed. Super large size: 4.5X2.3 Inch, can hold up to 7 pcs 4/4.3 inch round coasters. 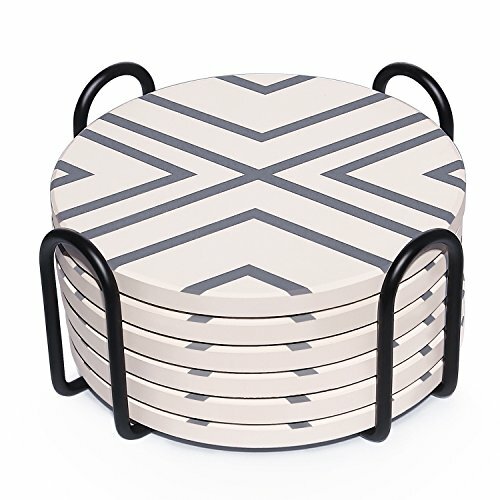 Coaster with metal holder set: the set includes 6 round ceramic coasters (simple modern style, 4 inch) and a 4.5-inch black metal coaster holder. Convenient for storage: you don't need to bear coasters placed everywhere. While not in use, you can put them directly into the holder, which will make your home tidier. Functional coasters: they are super water-absorbent, the cork back can avoid scratching your furniture and prevent coasters falling off the table. High quality iron holder: the iron holder is made of black metal, stain resistant and scratch proof, and won't get rusty. 30-day after-sales warranty: for any breakage caused by non-human factors, we guarantee unconditional replacement or refund. If you have any questions about this product by DAPRIL, contact us by completing and submitting the form below. If you are looking for a specif part number, please include it with your message.